Punjab Revenue Minister Bikram Singh Majithia today issued directions to all the Deputy Commissioners to get the demarcation of Muslim burial grounds recorded in the revenue records in their respective districts with immediate effect.In a communiqué issued to all Deputy Commissioners the Revenue Minister said that the Chief Minister Mr. Parkash Singh Badal and he was getting complaints from many Muslim organizations regarding illegal encroachments on the burial grounds for Muslims and also regarding illegal possession of such lands. He categorically said that no body, whoever he may be, would be allowed to have any illegal possession of such lands. Mr. Majithia said that during Id celebrations in Malerkotla few months ago this issue was raised before Chief Minister S. Parkash Singh Badal. He had promised to the Muslim brethren to do the needful after this issue was also was flagged by Punjab Muslim Welfare and Development Board. Mr. Majithia further directed to ensure removal of illegal possessions as per law before initiating demarcation process.Mr. 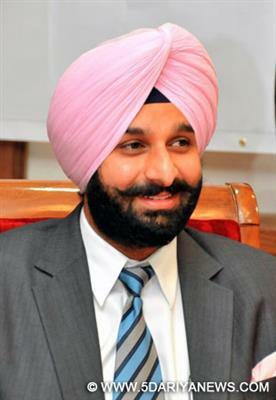 Majithia pointed out that the Deputy Commissioners were also asked to prepare estimates of funds required for construction of proper boundary walls around these sites in consultation with Punjab Waqf Board and Punjab Muslim Welfare and Development Board.Reiterating the State government’s commitment to provide required lands for burial grounds, Mr. Majithia also promised to get vacated such sites from illegal possession.